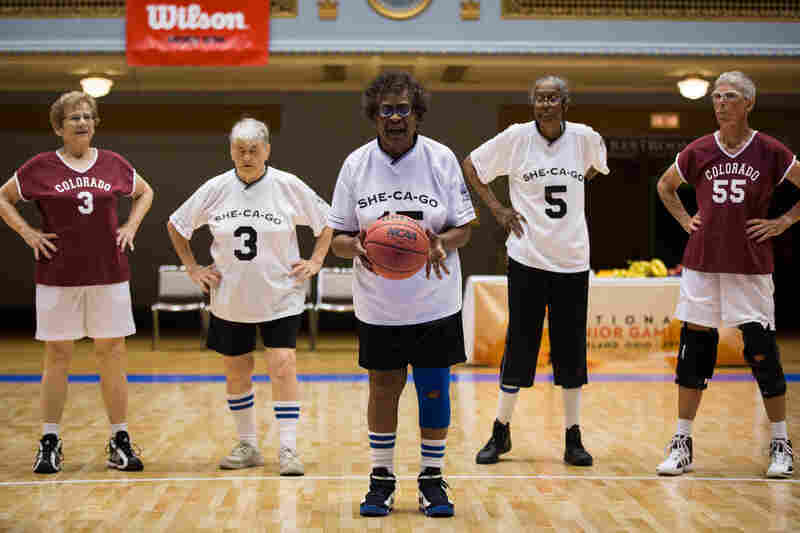 For One Seniors Basketball Team, The Game Never Gets Old At the National Senior Games, the women who make up She-Ca-Go, a team in the 75-to-79 age division, are still in it for the camaraderie and competition. The games finish a two-week run in Cleveland on Thursday. 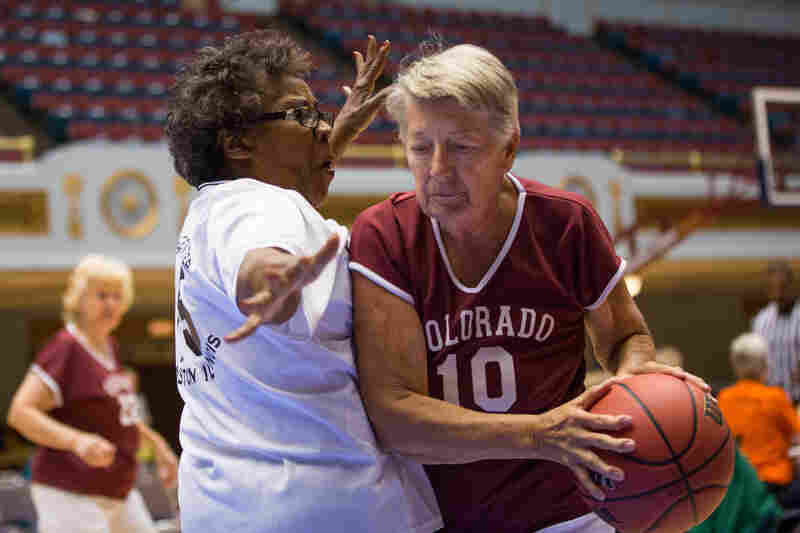 She-Ca-Go's Leona Cochran (right) attempts to block Jo Cahill's shot during the 3-on-3 women's basketball game against the Colorado Combos at the National Senior Games in Cleveland on Monday. The team are in the 75-to-79 age division. Coach Hugo Denado talks to his team, She-Ca-Go — Edwina Dennis (left), Roberta Leone and Cochran. The fourth and fifth players were unable to attend due to health problems, so the team played without any substitutes. This is the first time She-Ca-Go has played in a competitive contest since the last Senior Games two years ago. The team practices every week at the Levy Senior Center in Evanston, Ill. The game's action is fairly slow, but despite their age, the women play a very physical game. The 3-on-3 games are played on a half-court, where each player plays offense and defense. 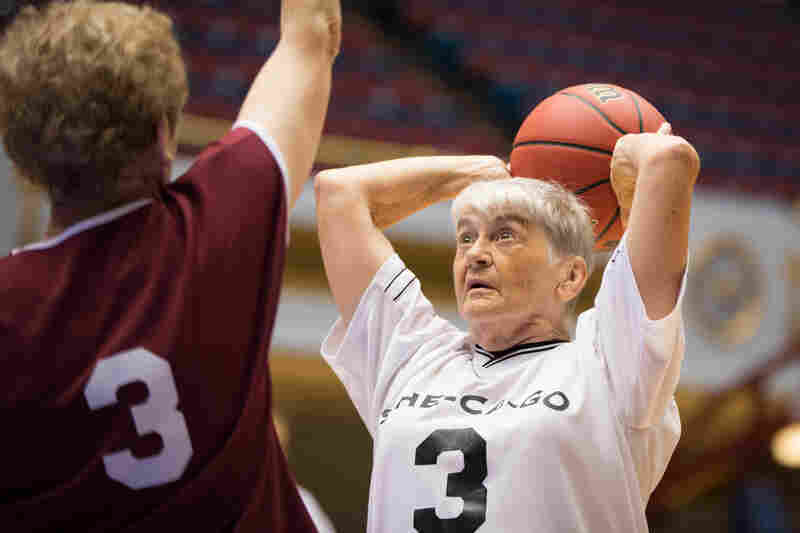 Dennis has been active her whole life but started playing basketball when she was 70. "Everybody I know is dead, in my opinion, they're dead or in the wheelchair cause they won't move!" she says. Leone has played basketball since she was young. She-Ca-Go has been around for about 20 years. Leone, Dennis and Cochran have played together for the last five. Cochran prepares to take a foul shot. Her days with the team may be over because of arthritis in her knees. She-Ca-Go lost all five of its games during the tournament. As athletes age, participation in team sports seems to fall by the wayside in favor of more low-impact activities like swimming and walking. But that's not for everyone. 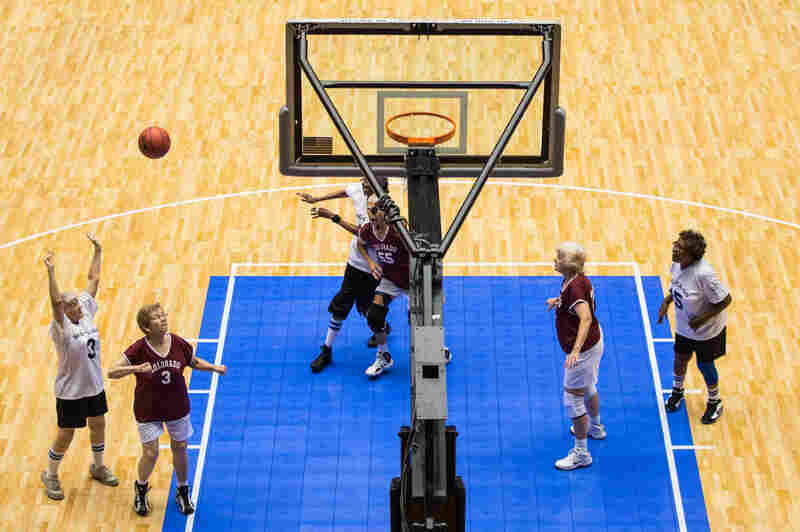 The National Senior Games finishes a two-week run in Cleveland on Thursday. 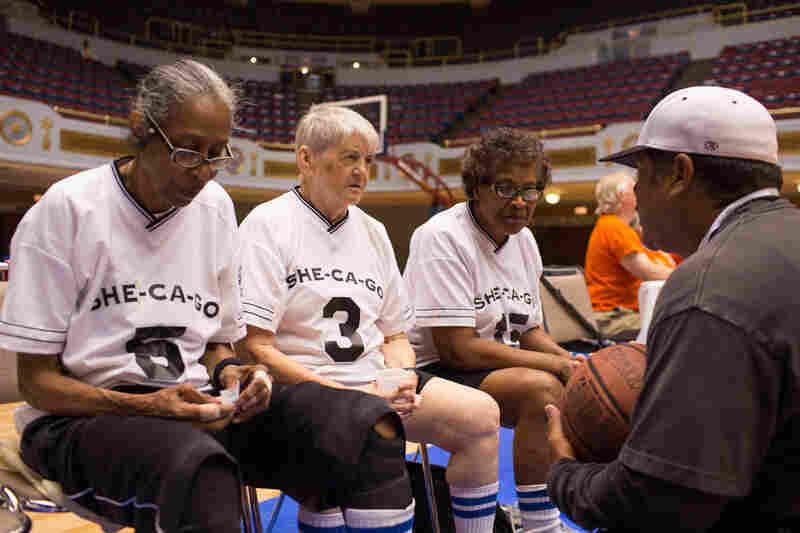 The players for She-Ca-Go, a women's basketball team in the 75-to-79 age division, are still in it for the camaraderie and competition. On Sunday, She-Ca-Go (guess where they're from?) played the first game of the 3-on-3, half-court tournament. Only three women made the trip to Cleveland — players four and five are dealing with Parkinson's and shingles — so there was no one to spare. It was the team's first counting, competitive contest since the National Seniors Games two years ago. First-half highlights belong to the opponent, San Diego Class Act, which certainly is with its killer pick-and-roll plays and cuts to the basket. She-Ca-Go looks hesitant and a step behind. Early on, the team's post player, 5-foot, 10-inch Edwina Dennis, gets bonked with an elbow, raising a walnut-sized lump on her head. It's the price of doing business in a sport Dennis, 79, loves and needs. "Everybody I know is dead, in my opinion, they're dead or in the wheelchair cause they won't move," Dennis says. She's been moving her entire life but only playing basketball since age 70. 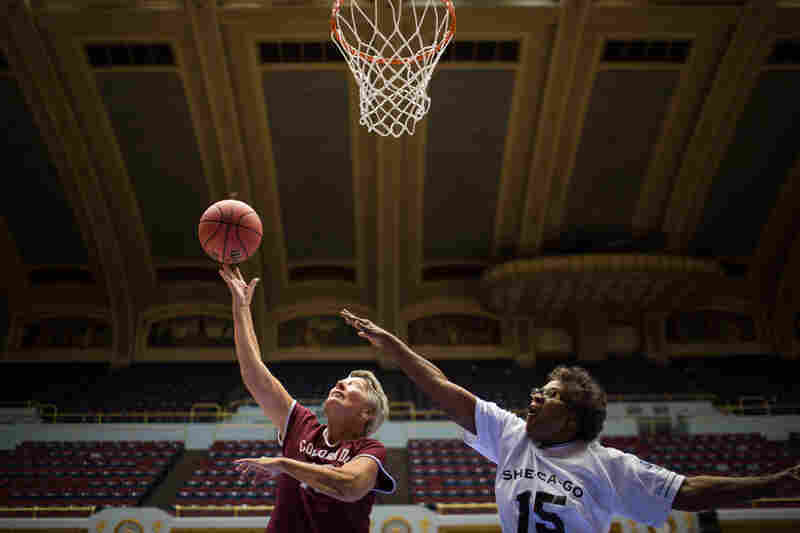 Her teammates Roberta Leone, 78, and Leona Cochran, 79, meanwhile, are basketball lifers. "I just love the strategy, and there's a lot of thinking that you have to do when you play," Leone says. Cochran says she always loved defense. "I just felt I was good at that, and at one time I was. But that's the part I like, being able to get in there and stop this other guy from keepin' the ball," she says. The team has been around for about 20 years. The three women have played together for the last five years, mostly practicing and scrimmaging every week at the Levy Senior Center in Evanston, Ill., through divorce and death. None of them has a husband. They've got families, both off and on the court, says Cochran. "It's good to be part of a team. Sometimes things aren't always smooth, but at the end, when you leave and what happens? You come back next week, and you're back with these people," she says. The game ends with a 42-16 win for San Diego. The action, not surprisingly for this age, is fairly slow. Reaction times aren't what they used to be. But it's striking to see the jostling, the body contact, something you don't normally see with women this age. Is there some psychic benefit to putting your body to that kind of test? All three shake their heads no. Dennis, with an ice pack firmly on her head, shoots a look. "I don't like anybody to touch me. I don't like it period. Don't even on a bus. Don't touch me. I don't like it, but you got to deal with it, that's right!" she says. Over two days, She-Ca-Go loses all five of its games, the last one by only five points. Everyone contributes, but Cochran was noticeably hobbled by arthritic knees. It's why she may finally be done. Her departure may mean the end of She-Ca-Go. But Leone wants to keep playing as long as she can. And Dennis, who turns 80 in January, says she may sign up with another team because, in her words, "I ain't quittin'."